Iain travelled to Les Saisies in the Beaufortain region of the French Alps with his family at Easter. 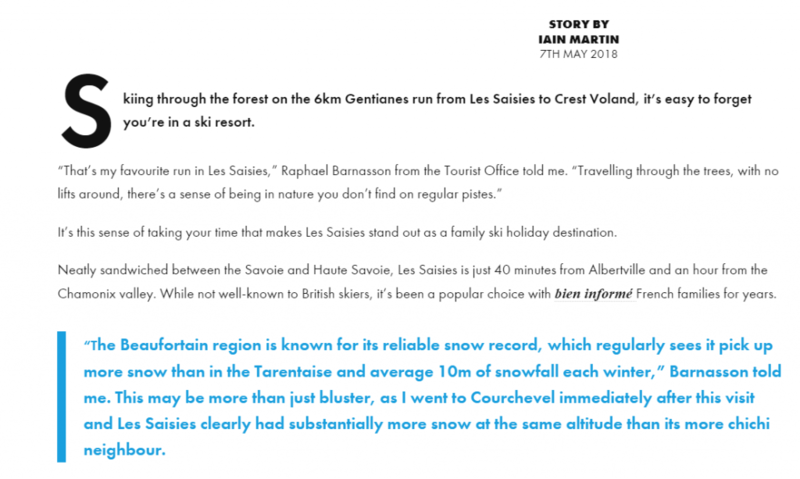 His article on family skiing in the Espace Diamante region was published on InTheSnow Magazine’s website last month. Iain stayed at the superb CGH Hameau du Beaufortain self catering apartments, booked through Erna Low. If you are travelling with a family, this property is highly recommended. It’s located right on the slopes, within a few hundred metres from the ESF meeting point and in addition to the well-appointed apartments, there is a swimming pool, sauna and fitness room to enjoy. The only negative is the Wi-Fi and 4G signal – if you do need to do any work, pop into town on the free bus and enjoy a coffee in the excellent La Chocolatine. Iain drove to Les Saisies, crossing the channel using Eurotunnel’s Flexiplus service – included for all Erna Low bookings. The Flexiplus upgrade allows you to drive on to the next available crossing, without being restricted to any particular time, as well as giving you access free food, drinks and newspapers in the Flexiplus lounge. It helped that the snow was superb during the trip. Not only were snow depths excellent throughout, despite increasing temperatures, but fresh snow fell during the week, thanks to the Beaufortain micro-climate. You can view the full gallery of photos from the trip on the Skipedia Facebook page and view one of Iain’s snow reports during his stay below.